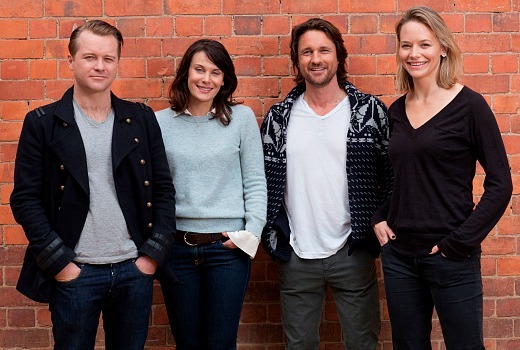 Martin Henderson will star in TEN’s upcoming drama series Secrets & Lies, which commenced production in Brisbane this week. Henderson, best known for films such as The Ring, Little Fish, Bride & Prejudice, Off The Map and Devil’s Knot, will be joined by Diana Glenn (The Slap, Killing Time) as Christy Gundelach, Anthony Hayes (Devil’s Dust, Bikie Wars: Brothers in Arms) as Detective Cornielle and Adrienne Pickering (The Reef, Rake) as Jess Murnane. Produced by Hoodlum, the six-part series will be filmed in and around South East Queensland. Henderson plays Ben Gundelach, an everyday family man who finds the body of a young boy and quickly becomes the prime murder suspect. As his world falls apart, Ben finds himself with no choice but to try to find the real killer. At stake is his marriage, his kids, his reputation and his sanity. The series had previously been announced to air later this year, subtitled Secrets & Lies: The Track, with plans to feature other Secrets & Lies stories if it proceeds to a second season. It is based on original idea written by acclaimed author Stephen M Irwin, produced by Tracey Robertson, Leigh McGrath and Nathan Mayfield. So I wasn’t the only person who watched Echo Point & Paradise Beach. Sounds like a great show, nice to see something filmed in Qld for a change. Most stuff is done in either Melbourne or Sydney. David do you reccan ABC will come 3rd in the ratings this year? secrets & lies: the track is a bit of a mouthful. great cast. adrienne pickering is a standout in rake, and anthony hayes is going from strength to strength. looking forward to hearing more about this. I still remember Martin Henderson as Zach from Echo Point, and Anthony Hayes as young Gromit from Paradise Beach. I’ll watch anything with Anthony in it. He’s an absolutely brilliant actor.